“During the summer of 2015, I met with Representative Kevin Van Winkle to discuss a concern that I had in state law. As an attorney, I work with families to resolve estate issues following the death of a loved one. Colorado law required a grieving family member to work through probate court in order to transfer ownership of a motor vehicle that had belonged to the deceased. Representative Van Winkle went to work to draft a bill to simplify that confusing process. In January, he introduced House Bill 16-1051 and worked hard to pass that bill through the Democrat-controlled House of Representatives. Senator Chris Holbert then worked to move the bill through the state Senate. 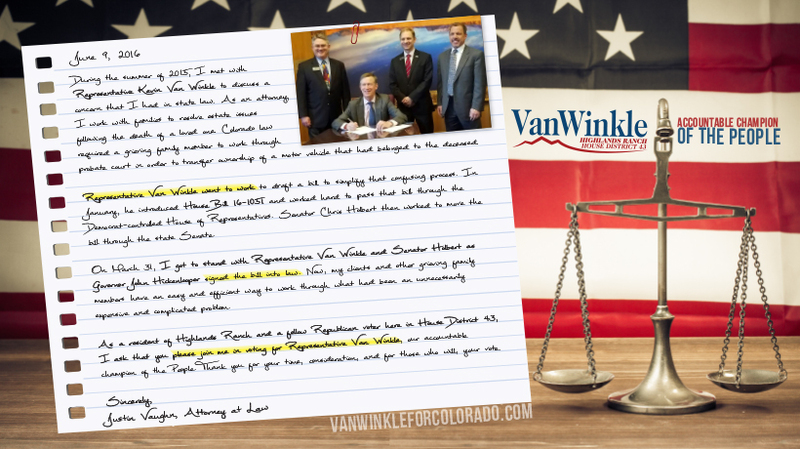 On March 31, I got to stand with Representative Van Winkle and Senator Holbert as Governor John Hickenlooper signed the bill into law. Now, my clients and other grieving family members have an easy and efficient way to work through what had been an unnecessarily expensive and complicated problem.